Jujube Wood Beaded Prayer Bracelet w/ Bodhidharma & Prayer - 8mm (4 Pack) - NEW! 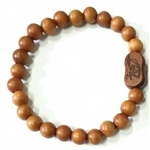 Jujube Wood Beaded Prayer Bracelet - Wrist Mala w/ Om Symbol and Hidden Kuan Yin - 8mm - NEW! Dragon Blood Wood, Verawood & Purpleheart Wood Beaded Bracelet - Wrist Mala - 8mm (4 Pack) - NEW! Tiger's Eye & Gold Sheen Obsidian Beaded Bracelet - Wrist Mala 8mm (2 Pack) - NEW! Boxwood with Kuan Yin Beaded Bracelet - Wrist Mala - 10mm - NEW! Brown Lotus Seed Wrist Mala - Prayer Bracelet - 27 Bead (3 Pack) - NEW! Sustainable Australian Sandalwood Wrist Mala - 10mm (1 Pack) - NEW! Stretchy Polished Rudraksha Seed 108 Bead Mala - Prayer Beads - 7mm (1 Pack) - NEW! Camphor Wood 108 Bead Buddhist Mala - Prayer Bead (4 Pack) - NEW! Knotted Camphor Wood 108 Bead Buddhist Mala - Prayer Bead (2 Pack) - NEW!